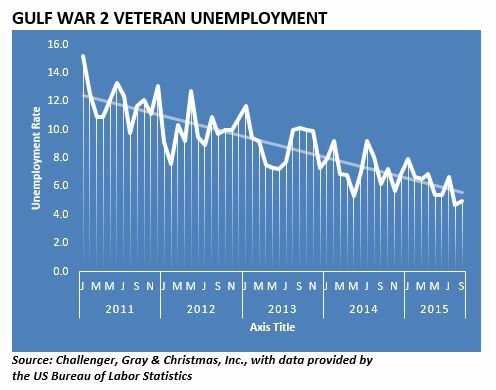 Veterans Day Employment Report: Vet Unemployment Rate Lower Than National Average | Challenger, Gray & Christmas, Inc. The study, released just ahead of Veterans’ Day by global outplacement and employee coaching consultancy Challenger, Gray & Christmas, Inc., highlights just how in-demand the skills and experience possessed by veterans are as the economy continues to improve. 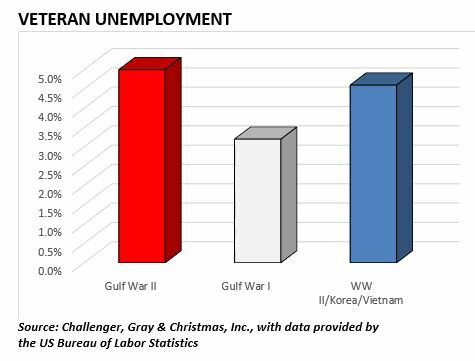 As of September, the unemployment rate among Gulf War Era 2 veterans was 5.0 percent, just below the national average of 5.1 percent. Just two years ago, the unemployment rate among these veterans was double the current level at 10.1 percent. In January 2011, it peaked at a record high of 15.2 percent. Even more impressive is the fact that this group has managed to achieve a participation rate of 81 percent. That is far better than the 62 percent participation rate among all Americans age 16 and older. It is also better than the 71 percent participation rate among those 20 years old and up. Despite the gains, veterans of the most recent conflicts have not quite pulled even with those from the first Gulf War. They too have a high participation rate of 81 percent, but of the 2.8 million of these veterans in the civilian labor force, just 3.2 percent are unemployed. “The success of both groups emphasizes just how much these veterans bring to the employment table. Most entered military service right out of high school and while many might have planned to enjoy a full career with the military, they are at least coming out of the service with skills and experience that are in high demand,” said John A. Challenger, chief executive officer of Challenger, Gray & Christmas. The drawdown of two wars and a push to make deep cuts in defense spending forced many men and women from the military earlier than expected. For example, in 2005, the Air Force announced 40,000 cuts to personnel levels. The Army slashed its ranks by 50,000 in 2011 and this year it cut another 40,000 troops along with 17,000 civilian personnel. Unfortunately, those who left the military between 2008 and 2011, entered a severely weakened economy and job market. However, concerted efforts by the Obama Administration and the nation’s employers helped move many veterans off the unemployment line. The process further accelerated as the economic recovery finally took hold. In November 2012, President Obama signed off on two new tax credits for companies hiring returning veterans. The Returning Heroes Tax Credit and the Wounded Warrior Tax Credit gave employers tax breaks for hiring veterans and veterans with service-related disabilities. The Administration also set up several websites to connect veterans and employers. It met with corporate leaders and encouraged them to hire former military. As a result, a number of major employers, including JP Morgan Chase, Delta Airlines, ManTech International, and Pitney Bowles, joined the 100,000 Jobs Mission, created to get veterans back to work. “Besides extended tax credits, these companies quickly learned that there are numerous benefits to placing former military to the payroll. They have proven leadership skills, ability to work in a team, strong work ethic, integrity and respect for procedures. Most workers’ day-to-day job tasks can be taught. It’s these soft skills that are difficult to teach and what makes veterans so valuable,” said Challenger. “Even though the economy is in a much better position to absorb those leaving or about to leave military service, the transition from the military to the civilian workforce is always challenging. “The most difficult part of the transition may be translating one’s military experience into terms that are meaningful to civilian employers. These men and women have skills and experience that are in demand, but they just don’t know how to describe them in a way that non-military recruiters understand. Luckily, there are a growing number of programs and services that help with this. That and the fact that employers are still going out of their way to hire veterans should help make the transition easier” he added.